The USF Department of Civil and Environmental Engineering presents “An Overview of the Texas Department of Transportation (TxDOT) Research Program” seminar by Wade Odell, on Friday, February 8th, from 3-4pm in CUT 202. The TxDOThas one of the largest state DOT research programs in the United States, fostering the knowledge discovery and innovation needed to operate, maintain and improve transportation systems in Texas and across the United States. TxDOT’sresearch and implementation programs are managed by the Research and Technology Implementation Division (RTI). With an annual budget of approximately $27 million, RTI manages approximately 130 research and implementation projects per year, resulting in cost savings to TxDOTof over $75 million per year. In this talk, Mr. Odell will present on the breadth of the research and implementation program in Texas, how a research idea can become a research project, and some proven technologies that have added value to the TxDOTresearch and implementation program through significant cost savings. Mr. Odell is a Research Project Manager with the TxDOTResearch and Technology Implementation Division, overseeing transportation research projects in half-a-dozen functional areas (e.g., Construction & Maintenance, Planning & Environmental, Safety & Operations, Structures & Hydraulics, and Strategy & Innovation). He is also a registered Professional Engineer (PE) in Texas, who holds his B.S. degree in Civil Engineering and his M.S. degree in Engineering from the University of Texas at Austin. 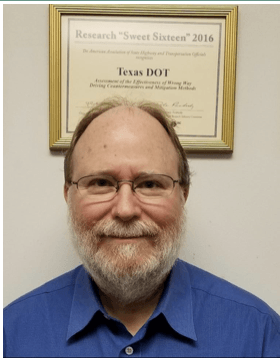 He has 33 years’ working experience in TxDOT.